As America’s solar leader for more than 35 years, SolarWorld maximizes any solar investment with proven, American-made quality, reliability and durability. SolarWorld panels are widely recognized as the industry standard in quality—the result of the company’s commitment to research and development, quality materials and manufacturing excellence. As a SolarWorld Platinum Installer, Gardner Engineering is among an elite group of manufacturer-approved, high-quality SolarWorld installers. We have been recognized as a top-tier partner of SolarWorld based on our excellent installation quality, our prompt and respectful customer service and commitment to high quality, American made products. We believe in long term customer satisfaction and we know that installing high-quality products is the best way to ensure that, especially to our clients throughout sunny Utah and all along the Wasatch Front. We sell and install SolarWorld as our primary offering and never compromise when it comes to quality. SolarWorld performs installation audits and requires excellent customer service and business practices before giving an installation company their mark of approval and we are proud have passed those rigorous standards with flying colors. 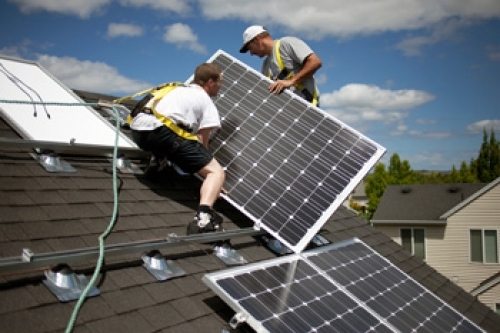 High-quality solar panels begin with high-quality materials. SolarWorld is so selective that they manufacture every solar cell they use—right here on American soil. Each cell is carefully inspected for possible damage, tested for efficiency, and classified according to color and power levels.